I've never been an artistic person, in the visual arts sense. I can't draw to save my life. So I always dreaded art class in school. During my sophomore year of high school, I had to take an art credit so I took a basic intro to art class. All my friends were taking cool classes like pottery, but I was stuck in remedial art. That semester I was introduced to the works of Vincent Van Gogh and I was immediately captivated. 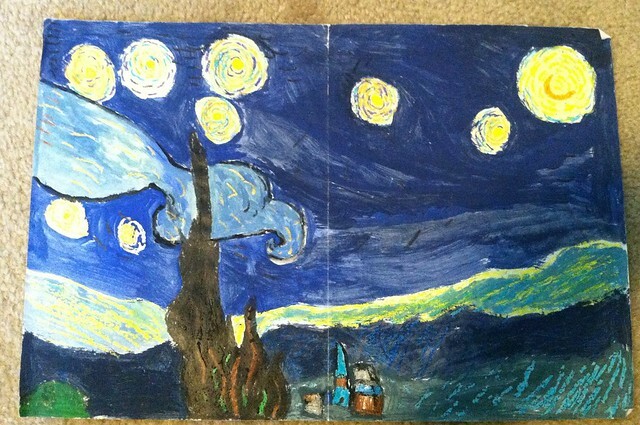 His Starry Night painting was so expressive and full of swirling emotion that when given the opportunity to complete a post-impressionism crayon-resist painting, I chose Starry Night as my muse. Now to say my version was good would be to laugh in the face of a brilliant artist like Van Gogh, and yet, I was very proud of how "not terrible" it turned out because, up until that point, my artistic endeavors often left me feeling like I wanted to cry due to my absolute lack of talent. So Starry Night has always had a special place in my heart for that reason. 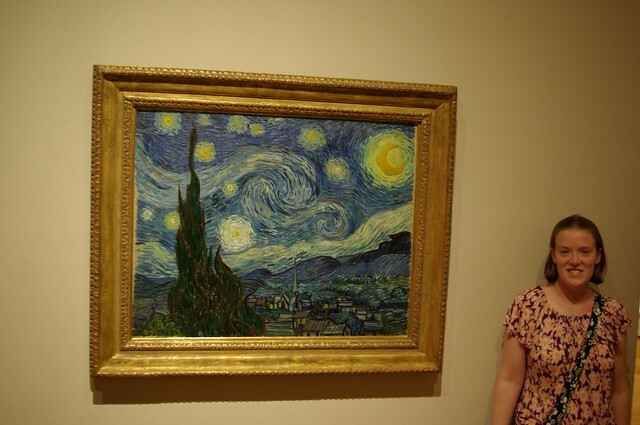 Back in 2004 when my husband and I were living in Germany we had the opportunity to travel to Amsterdam and I was excited about getting the chance to visit the Van Gogh Museum to actually see Starry Night in person. So as we're walking around the museum, I'm just waiting any second to turn a corner and have it appear to me, choir of angels and a dreamlike vision where everything is blurred out except for the beautiful painting I've been waiting to see come into focus. Except it never did. We walked through the entire museum and never saw Starry Night. 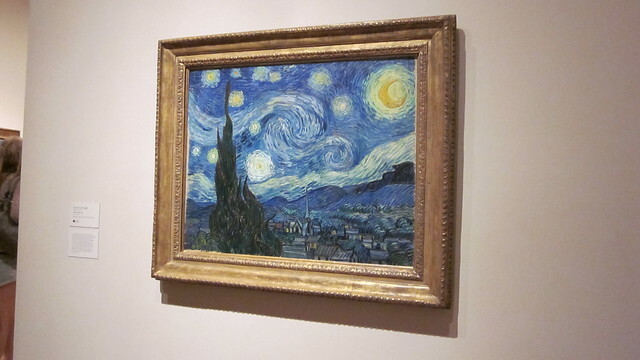 So my husband and I walked up to a docent and were like, "So yeah, where's Starry Night?" He looked at us as if to say, "Don't you know anything?" But instead just said. "It's not here." Ummm... Okay. "So where is it then?" "The Museum of Modern Art in New York." You mean to tell me that Van Gogh's most famous painting isn't even in his own museum? Oh the injustice. But fear not! Four years later, my husband and I were going to New York City, so of course a visit to MoMA was a must on the list. Except for one problem. Starry Night wasn't there. On loan to the freakin' Van Gogh Museum in Amsterdam!!!! Seriously? The universe just didn't want me to see that painting for whatever reason. Some things are just worth waiting for.